Computer Telephony Phone Software | CTI Software | Computer Telephony Integration Telephone Software. Computer Telephony Integration (CTI), also known as telephone software, is a product that enables computers to know about and control phone functions such as making and receiving voice, fax, and data calls with telephone directory services and caller identification. The integration of telephone software and computer systems is a major development in the evolution of the automated office. Contact DSC to learn more about CTI Computer Telephony Integration software and call center software. Computer Telephony Integration CTI software is a rich set of phone software library routines that enable application programs to control your phone system. This comprehensive CTI telephone software lets you increase employee productivity, enhance customer service and reduce costs by combining the capabilities of our robust phone system with the custom functionality of your Windows, Unix or Web applications. Phone systems from Database Systems Corp. are state-of-the-art computer phone systems that handle inbound and outbound phone calls for small to large organizations. Our CTI phone systems support both analog (Wizard Series) and digital (Pacer Series) phone lines and can be configured from 1 analog line to a 1000 digital lines. 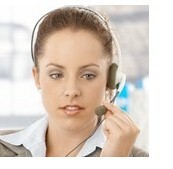 Calls are either initiated by the phone system or accepted from the outside. Developed with industry standard components (Dialogic, Intel, and Windows), our phone system has features and functions that can only be found in large scale PBX�s, but at a fraction of the cost. Inbound CTI Phone System - The DSC phone system processes inbound phone calls and distributes these calls using our ACD (Automatic Call Distribution) system. With our IVR (Interactive Voice Response) system, callers can perform self-help functions without speaking with an individual by making simple selections using the keypad on their phone set. Our phone system can even connect calls to your employees who are working at home or in remote offices. Outbound CTI Phone System - Our DSC phone system is also capable of performing outbound calling functions including dial on demand, predictive dialing, progressive dialing, and preview dialing all at the same time. For further information, please visit our Predictive Dialer webpage. Blended CTI Telephone Software - The Database Systems Corp. phone system is capable of performing both inbound and outbound calling functions simultaneously. This blended call capability makes our phone system ideal for call centers. DSC now offers an affordable and expandable inbound telephone system and voice broadcasting (VB) analog phone system with complete phone software features. This 4 line auto dialing system includes our voice message and broadcast Wizard software or comes optionally with our comprehensive software development toolkit. You can program your own system or we can provide you with a custom IVR or message broadcasting application. These applications can be easily ported to our digital T1 phone system (PACER) when your call volume requires a larger system. This entry level telephone software system can be easily expanded by adding agent lines and software to support a small contact center operation including our award winning CRM application and predictive dialer solutions. DSC provides ivr and voice broadcast software including our VB wizard development tool for creating voice broadcasting applications. This wizard guides you through each step when defining your VB applications. Telephone applications can be developed quickly. Simply record your phone prompts and fill in the blanks. Launch PC/WEB applications - Specific PC, Unix or Web applications can be automatically launched using our telephony software based upon data provided by your phone system. Caller Identification (Caller ID or ANI) - Using our phone software, information from your existing caller database appears on-screen when your telephone rings and remains on the screen during the call. IVR Collected Information - Vital information collected by your phone system from the caller can be passed to your application by our phone software. Our computer telephony integration software manages this process and free agents to be more productive. Automated Dialing of Outgoing Calls - You may point and click any phone number in your computer database or Softphone. Your telephone then dials the call - a must for maximizing the productivity of outbound telemarketing or call center service desks. Predictive Dialing - To further increase the productivity of your call center, calls can be launched from the PACER dialer and connected to your agents using our computer telephony software. 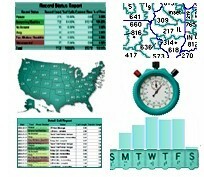 Online Reporting - Database Systems Corp CTI includes a comprehensive online reporting system plus the ability to customize reports and graphs to your specific needs through our phone software. Database Systems Corp. has prepared a full length presentation of our analog and digital phone systems with CTI telephone software. This softphone demo can be easily downloaded and viewed. 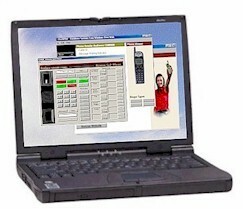 Included in this presentation are several different CRM and telephone software campaign demonstrations along with an explanation of our computer telephony phone software capability with online reports. This presentation includes our WIZARD and PACER's robust features plus a tutorial on predictive dialing. Also included is a presentation on computer telephony software with remote agents and web integration. Simply click on the image to your right to start the download process of our PACER and CTI demonstration. One of the important benefits of today's telecommunication advancement is the ability for your employees to work from home. 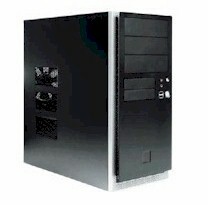 DSC has developed a family of cti products that facilitate and promote this capability. Our CTI software, when combined with our analog and digital call center phone systems, fully supports remote agents. Now your workforce can be significantly expanded with the addition of work at home employees. Calls arriving at your call center can now be routed transparently to your work at home staff members, just as if they were working from your call center. Work at home employees can likewise initiate calls through our phone systems and software in the same manner. You have complete control of this environment thanks to our monitoring software. The economic savings and environmental advantages are significant. To obtain additional information about our remote agent capability, please view our Telecommuting Software page or download our video presentation. A key feature of our CTI software system is the ability to generate real time reports and graphs. This important measuring system helps you observe and control the performance of your call center and phone system with clear and meaningful displays. Graphs and charts of operational statistics let you measure the effectiveness of each user and campaign. Reports and graphs include both inbound and outbound statistics. The information contained in each of these reports can be downloaded into a spreadsheet format for individually customized reporting. A complete sample of the reporting capability of our CTI software can be seen by clicking on the graphic to your right. Please note that these reports are just samples - your reporting may vary. For an up-to-date list of CTI software functions, visit our CTI Softphone API Library web pages. Contact DSC to learn more about computer telephony integration phone software and cti software applications.